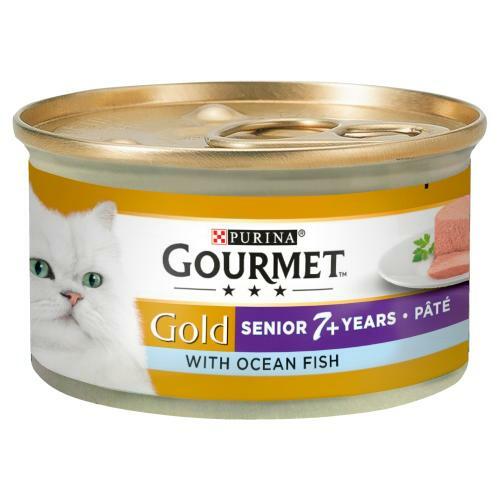 Nutritionally rich the Gourmet Gold Pate with Ocean Fish Senior Cat Food is a deliciously tantalising meal which lets you pamper your cat every meal time. The luxuriously sophisticated the recipe is made especially for your maturing cat and providing them with the nutrients such as vitamin E to support bones, joints, teeth and kidneys they need to stay healthy, active and happy. Suitable for senior cats of the age 7 and over will find this a delicate and smooth flavoursome meal which appeals directly to their feline prowess.